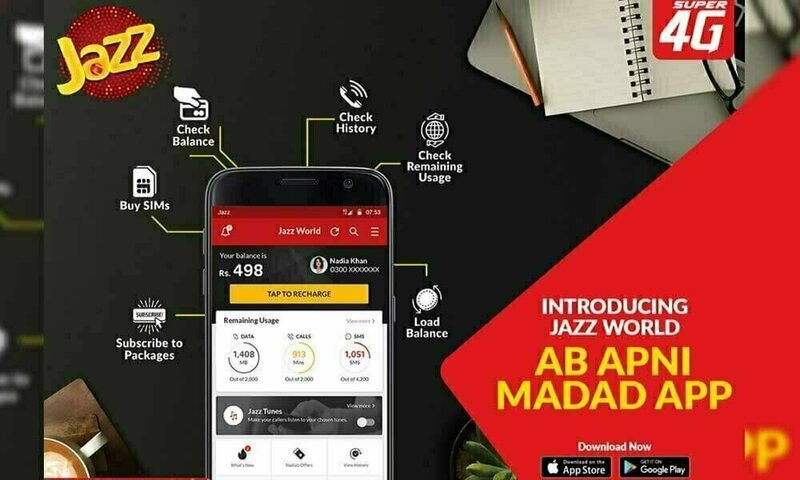 Mobilink Jazz has launched Jazz World App for its users accessible on both iOS and Android platforms. Jazz World is the solution to all the client’s Jazz/Warid account needs. The client would now be able to deal with his/her account effectively with a couple of taps. View prepaid mobile balance and postpaid bill. The user can check utilization and remaining MBs, Minutes and SMS. Subscribe to the bundles and offers. Log in with a single click when using the Jazz Mobile Data Network. The user can oversee up to 5 numbers with his/her Jazz World account. The user can get bundles and offers especially suggested for his/her usage. The user can recharge prepaid balance and pay the postpaid bill using JazzCash, credit/debit cards or scratch cards. The user can get discounted bundles. The user can view and download his/her usage history. Order new or replace SIMs and get them conveyed to his/her doorstep. One of the main features of the app is that the user can access his/her account balance history and details. On the front page of the app, it shows the user’s mobile account balance. The user’s mobile number and the name is displayed along with his/her picture. If the user has availed any bundle or package, then it tells that how many MBs of mobile data is remaining, how many On-net and Off-net minutes and how many SMS are remaining. You can also subscribe to ne w data bundles.